As part of their overall duties of management, the trustees must ensure that the major risks to which the charity is exposed are reviewed and that systems are established to mitigate those risks. 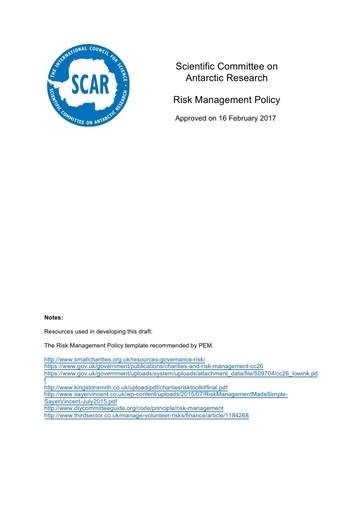 The trustees consider that a major risk is one which, if it materialised, would have a significant adverse impact on the charity’s ability to function and achieve its purposes, namely initiating, developing and coordinating high quality international scientific research in the Antarctic region (including the Southern Ocean), and on the role of the Antarctic region in the Earth system. The trustees recognise that risks can arise not only from the charity’s activities but also from failure to act or exploit opportunities. The trustees do not consider that all risks should be avoided. They are not averse to taking reasonable risks as part of their strategy to achieve the charity’s objectives. However, they wish to be made aware of the major risks the charity faces so that they can plan how to manage those risks and mitigate their effects. The trustees have therefore appointed the President and Executive Director to review major risks and make recommendations to the trustees as to how to manage them. The trustees expect all staff and volunteers when engaging in any activity to consider the risks it poses and to act in accordance with any recommendations made for risk management. The trustees expect that staff and volunteers will not engage in significant types of activity which are not similar to activities the trustees are already aware of, without first having made to the trustees a proper proposal for the charity engaging in such activity, including an analysis of the risks such activity might pose to the charity. Such new forms of activity might include, for example, new forms of fundraising or new forms of sustained service provision. The trustees have the same expectation in relation to significant increases in activities already pursued by the charity or significant changes in the way those activities are pursued. The trustees recognise their obligations under the Charity Commission’s guidance on Reporting Serious Incidents: guidance for charity trustees’. The trustees will ensure that major risks are reported to the Charity Commission and/or other relevant authorities as and when required by law and in accordance with the Commission’s guidance. The Executive Committee will regularly review the operation of this policy.